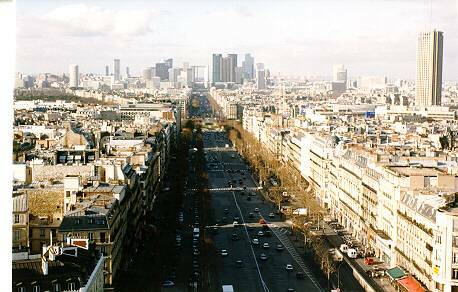 Picture 1: Front view of the Arc looking west, standing in the middle of the street (champs d'elysees) to take the picture. Yours Truely in front of the dang thing. The view from inside. View is looking from what above was the right hand side base of the arch towards the left, upwards. The names inside are those of famous generals in Napoleon's Armies. There's a museum that costs about $10 (pretty much worth it) that you enter through the base immediately to (my) left. The museum is IN the arch (a spiral staircase leads up). The history is explained there and you get to see the other ideas they were considering building - including a giant elephant with a musical-concert-style auditorium in the belly. Thank goodness; I like the arch better. All the famous invading armies have marched through it as a symbol of conquoring the city, which is much better than burning down city hall (the Louvre, I think, and they made it into an art museum). This is the view from the top of the Arch, looking to the West (I think! ), towards the modern Paris downtown area. 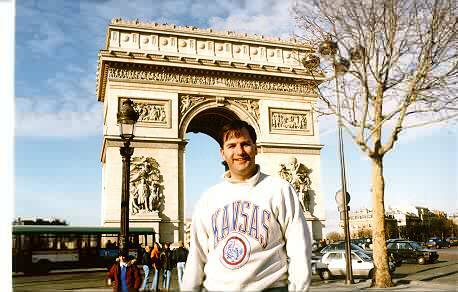 The street is the Champs d'Elysees (pronounced: Shams deleezay), the most famous street in all of Europe, probably. I would say the world, but Wall Street (New York USA) is probably even more famous. 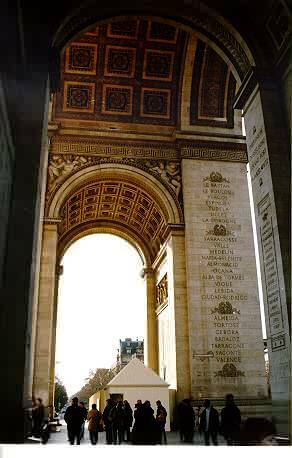 The structure you see at the end of the street is another arch, squared off. 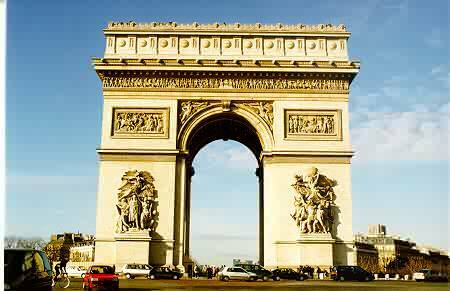 It's called the Defense Arch, or in french, L'arc du Defense. It's in front of a really, really big open square that can hold 100,000+ people for concerts, riots, that sort of thing. View looking West at the Tower. Built in the 1890's (?) by Gustav Eiffel, who also designed the superstructure ("innards") of the Statue of Liberty. 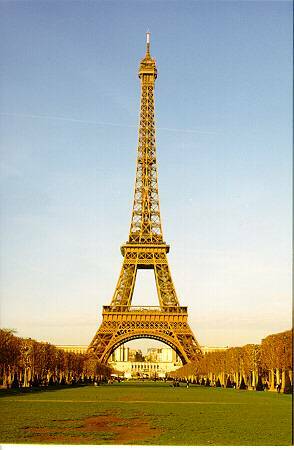 There are three observation decks, the bottom two are obvious, and the third is at the top. 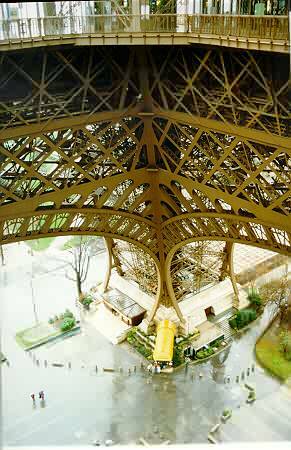 It is possible to climb the stairs but beware of (a) getting tired, and (b) looking down through the grating all the way to the bottom! (No, I didn't do this). One neat thing: It's very stable. A model of it won't tip over until it's tilted over 45 degrees. I don't recommend testing it on the real thing though. There's houses nearby. 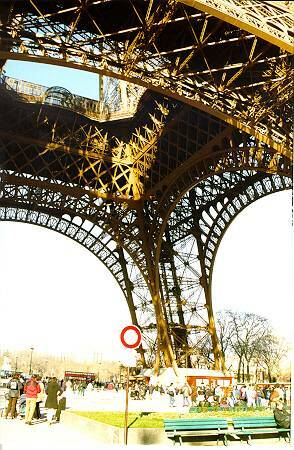 The Infamous "Crotch Shot" of the tower. The building in front is the entrance to the elevator. The caticornered base has a small (vastly overpriced) restaurant. The base to the right has stairs. The first day I was there it was a bright, sunny Saturday and there was an immense line. I came back the next day when it was raining to go up (there was no line then). It's open at night until 10 pm for romantic strolls. Yours Truely in front o' de dang thing. View from the first level observation deck, down at the South-East base, on the rainy day I went back. That's the overpriced restaurant below. 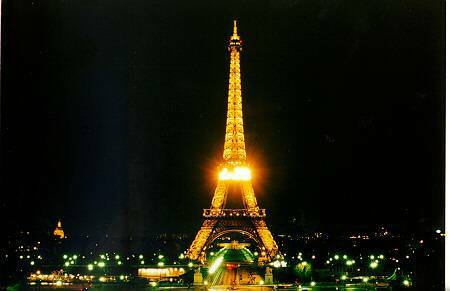 Eiffel Tower at night. The bright part is a sign; it's a countdown clock of days until the year 2000 Millenium celebration, then at about 740 (I think). The view is looking East from the big museum you can barely see in the first picture. I took this shot by setting my camera down on a concrete wall and using a 1 minute exposure or so at a high f-stop to keep everything in focus. 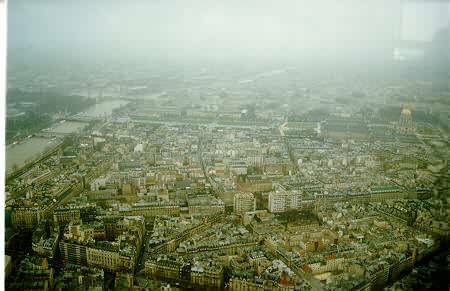 View from the top of the Eiffel Tower on a rainy day. The view is looking North by northeast, along the Seine. The gold dome building is some museum I didn't have time for (yah, like I had a chance to visit more than 1% of the museums in a weekend trip!). This is the Flying Naked Dude! 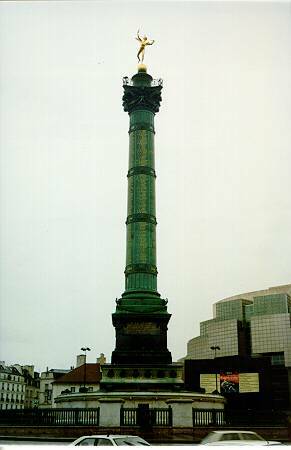 Really, its' the monument to Liberty on the site where the Bastille was (they tore it down, remember? 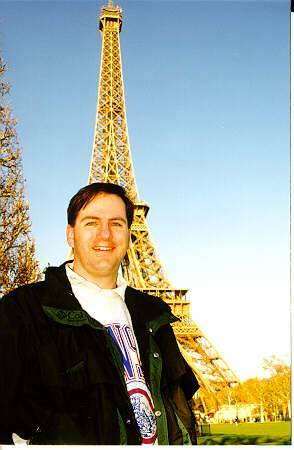 )(on Bastille day?!)... (Okay, I only vaguely remember my European history, too, so don't sweat the small stuff).